EDINBURG, Texas (November 30, 2018) – The Rio Grande Valley Vipers (6-5) fell to Salt Lake City Stars (5-5), 114-119. Houston Rockets assignee, Brandon Knight tallied 16 points and five assists in his return to the court. Salt Lake City Stars got ahead early in the contest, challenging the Viper defense. Tony Bradley and Willie Reed tallied eight points apiece as the Stars claimed a 38-18 lead at the end of the first. RGV made some noise in the second quarter cutting into the Stars lead 61-50 heading into the break. Offensively for the Vipers Tim Bond had eight points and four assists. Bradley ran away with the scoring lead for the Stars as he dropped 16 points in the first half. A tremendous third quarter lifted the Vipers to an 87-79 lead. RGV struck for 37 points in the quarter. Michael Frazier was the current scoring leader with 13 individual points. Reed grabbed nine defensive boards for the Stars and dished out four assists by the end of the third period. The contest did not disappoint in the final quarter of play as both teams traded blows. Two players on the Salt Lake City side had double-doubles. Bradley had 18 points and 11 rebounds and Reed totaled 18 points and 17 rebounds to help the Stars to a road win. Bruno Caboclo had a season high five blocked shots in an attempt to stop Salt Lake. Frazier led his team with 20 points, five assists and six boards. The Vipers will head on a three-game road trip starting at Salt Lake City on Monday, December 3 at 8 p.m. (CST). 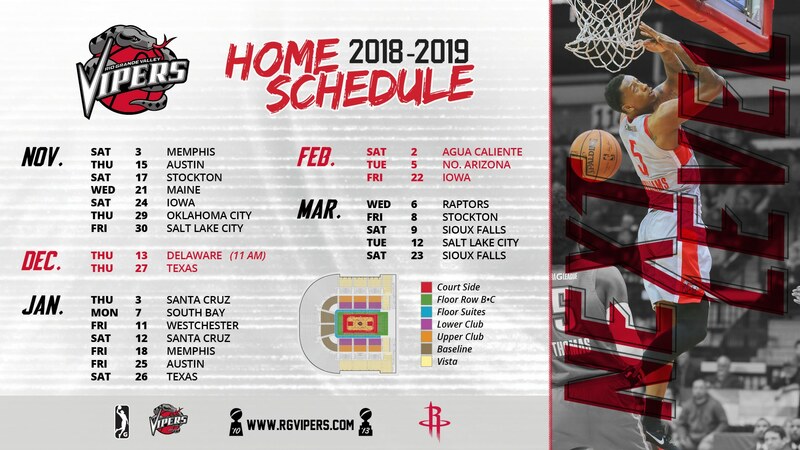 The Vipers will return to action at Bert Ogden Arena on Thursday, December 13 with tipoff at 11 a.m. For more information, contact the RGV Vipers at 956-56-ARENA or visit www.rgvipers.com.